The inspiration for making this came from the main material I used. I find that’s often the way. Seeing or handling material gives me ideas, or contributes to ideas that have been simmering away in the background. 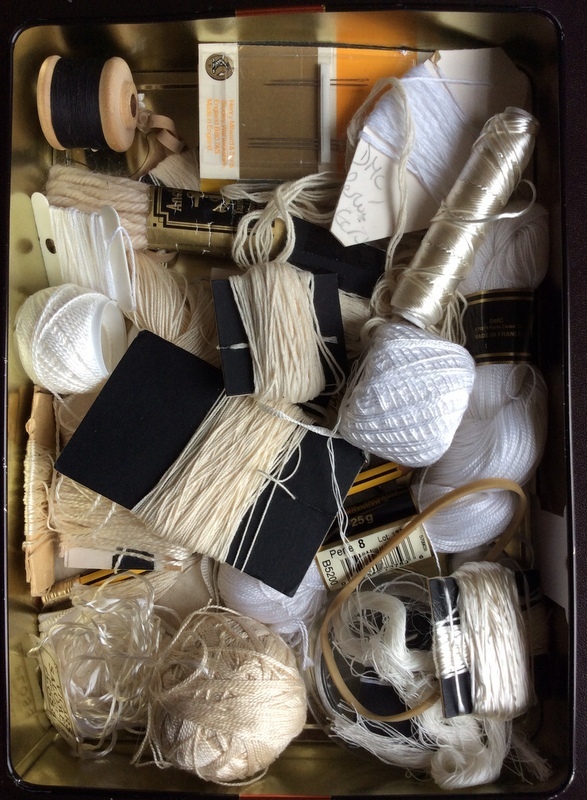 The material in this case was a bundle of silk sari strips – you’ve probably seen them – which are, I think, recycled material. 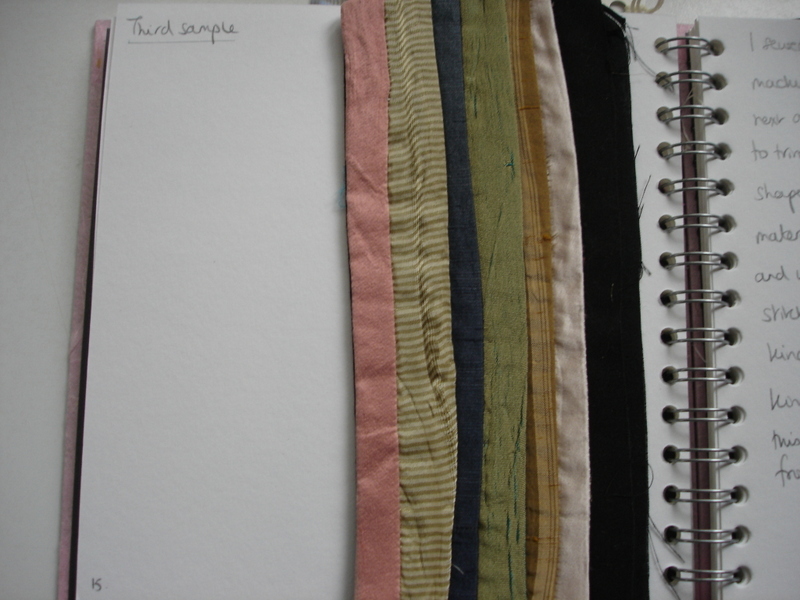 Long strips are sewn together to make a continuous length of material which is then bundled up for sale. 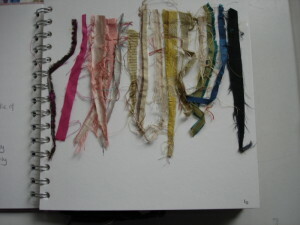 The colours are often very bright but what attracted me to this bundle was the relatively muted range of shades. 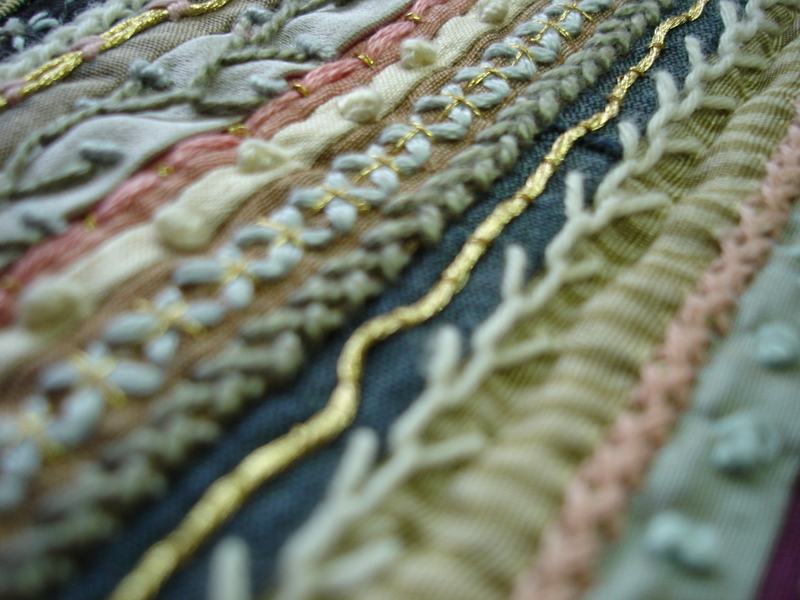 For my City & Guilds Diploma course I’d been studying the history of British embroidery, which turned out to be fascinating and one of the best aspects of the Diploma. 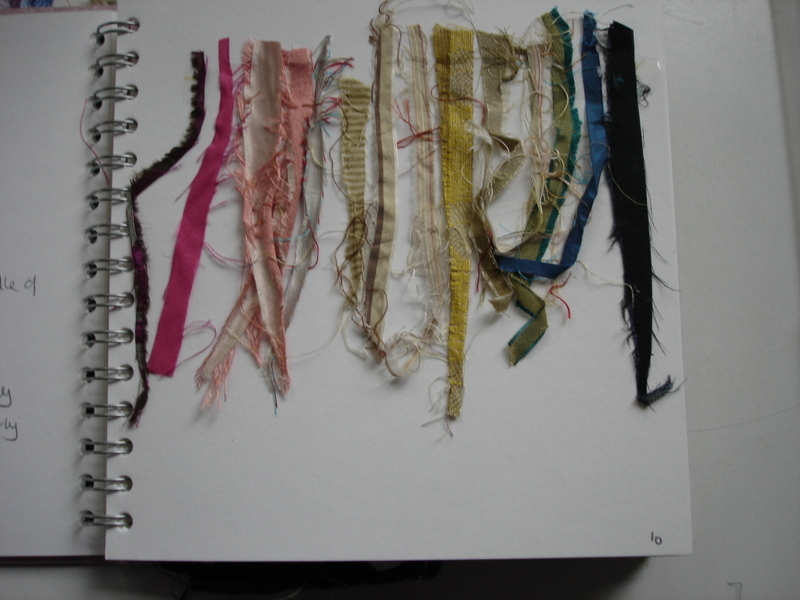 I’d been very struck by the crazy patchwork made by ladies with scraps of silk in the nineteenth century. There are plenty of examples of images on the internet. It’s wild, it’s garish, but somehow it kind of works. 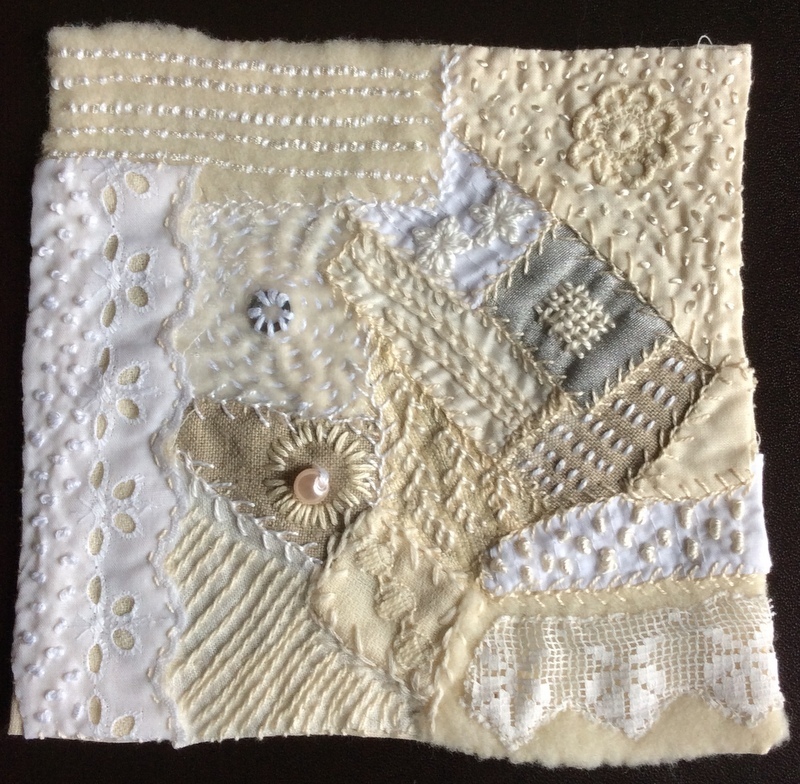 Here’s a link to an example held at the Quilt Museum in York. 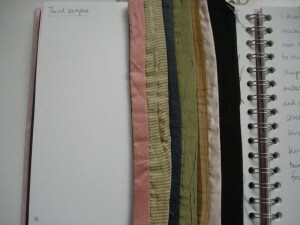 Crazy patchwork together with the silk sari strips gave me the idea of producing a kind of linear crazy patchwork. How I made this: I cut a ground fabric (a piece of black cotton satin that I bought as an offcut for very little from Greenfibres in Totnes) to the approximate size I needed for a Kindle cover. I’d made a paper pattern of the right size and used it to draw the Kindle cover onto the black cotton in white drawing pen. Then starting at one edge I machine-stitched a length of the pressed sari fabric onto it and pressed it so that the machine stitch didn’t show. Then I took my next strip and machine-stitched it onto the first strip, so that a reasonable amount of the first strip showed, then pressed the second strip, then moved on to the third. Below is a photo of a small sample I made to be sure this method worked. The lines are quite wiggly, because the sari strips were of variable width. I thought this really wouldn’t matter too much once the piece was embroidered. 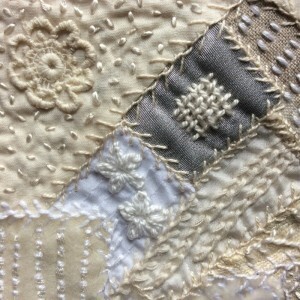 Then on to the really enjoyable bit which was doing the stitching. I used various stitches: feather stitch, fly stitch, French knots, couching, seeding, herringbone – whatever I felt like doing, in whatever colour and thread seemed appropriate. 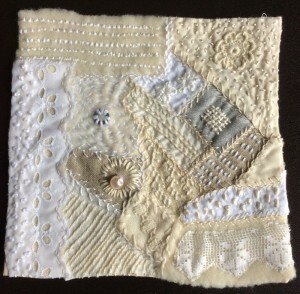 I loved doing the stitching. 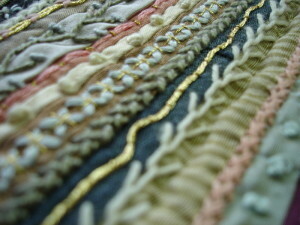 Once the piece was embroidered I then put a facing onto it in the same black cotton to form a smooth interior. 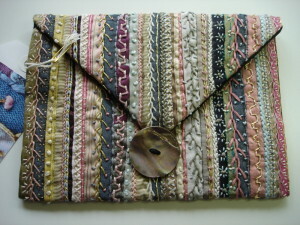 I turned it out, slip stitched it and then hand-stitched the two sides to form the envelope for the Kindle cover. Then I attached the big mother-of-pearl button which was the single most expensive item in the piece at £3.50. This project was really enjoyable and it used very inexpensive materials. Of course, it took ages to do, but we crazy patchworkers don’t mind that….. If you have any questions about this project please leave a comment or contact me.